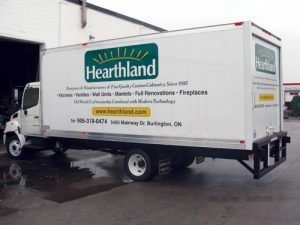 We can provide your business with professional graphics for your fleet of vehicles, trucks and trailers. We have the ability to do full graphics on large transport trucks at our facility as well as standard vehicle decals and magnetic signs. Working closely with Burlington Signs National design team, your business will get a professional layout. No job is out of reach when you come to Burlington Signs National. Using our HP large format colour printer we can supply full colour graphics for your vehicle application.